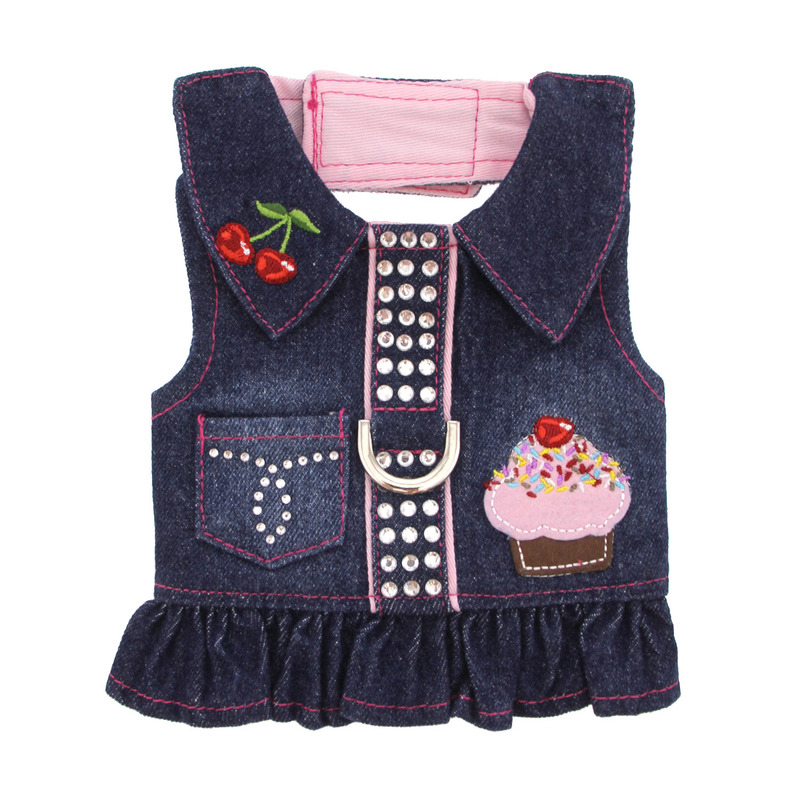 Show your girly pup's sweet and sassy side with this Cupcake Denim Dog Harness Dress from Pooch Outfitters! Hook and loop tape closures at the neck and belly. With this fun and flirty harness dress, your pretty pup will be ready to go out for a stylish walk! This harness may look sweet, but it's ruggedly built with sturdy denim that's lined in pink, and a heavy-duty D-ring for a secure leash attachment. We love all of the cute details of this stylish dog harness. It includes an embroidered cupcake applique and a working pocket that's embellished with rhinestones. Cheerful cherries are embroidered to the collar for cuteness from every angle! More glimmering rhinestones adorn the reinforced center panel for a glamorous look that really grabs attention. Contrasting pink stitching and a flirty ruffle finish off the festive look that's appropriate for most any occasion. Try pairing this harness with one of our pink Barking Basics leashes for a coordinated look from head to paw! This 100% cotton harness also includes heavy duty hook and loop closures at the neck and tummy for easy application and removal. It's perfect for shopping, visits to puppy playdates, and more! Cupcake Denim Dog Harness Dress Customer Photos - Send us your photo! Kiki just loves to wear her new cupcake dress! It's so comfortable with Velcro attachments at the neck and belly. (She is hard to fit because she has such a large chest for a small dog).This dress fits her wonderfully and Kiki looks so fashionable in denim! 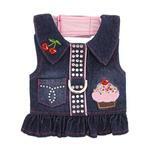 Cupcake Denim Dog Harness Dress is Precious! Posted On 08/16/18 by Terri S from Duncanville, AL Yes, Terri S recommends this product! The xxsmall I purchased for my Maddi is perfect. I love the doggie clothes I purchased for Maddi. I also love your site. I have also experience returning an item and it was a smooth process! 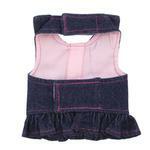 Love, love, love this denim harness. It is so well made, offers a superb fit & is exactly what I was looking for. Posted On 10/01/17 by Patty H from Nixa, MO Yes, Patty H recommends this product! My Yorkie has a darling denim harness which I hoped for for my new Westie puppy. This is beyond perfect. Well made, fit well for later. Love, love, love! Posted On 07/29/17 by Barbara J S from rochester, NY Yes, Barbara J S recommends this product! Posted On 06/17/17 by Deborah & Rami Kawar from Spring Creek, NV Yes, Deborah & Rami Kawar recommends this product! Posted On 06/16/17 by Deborah K from Spring Creek, NV Yes, Deborah K recommends this product! we have a 2.5 pound yorki named Cupcake. This vest is so cute on her. Posted On 03/22/17 by Rhonda D from , TX Yes, Rhonda D recommends this product! Go up one size. Doesn't fit according to the measurements given. Posted On 03/15/17 by Cindy T from Mobile, AL Yes, Cindy T recommends this product! I really love this, lots of detail. Unfortunately, I ordered the wrong size, going to have to wait to get a bigger one. Posted On 01/01/17 by Heidi S from Fayetteville, GA Yes, Heidi S recommends this product! Love this dress. Looks and fits terrific on my Chihuahua! Posted On 12/05/16 by Jane S from Findlay, OH Yes, Jane S recommends this product! Size XS. This little dress is even more adorable in person. Fits my little 5 pound Yorkie perfectly. Very well made. Posted On 06/16/16 by Jan K from Peoria, AZ Yes, Jan K recommends this product! I waited for this to come back in stock and it was worth the wait! It's so cute and it looks so cute on my baby. It runs very true to size. A little small ish so measure well. Posted On 05/19/16 by Jane D from El Cajon, CA Yes, Jane D recommends this product! Posted On 05/18/16 by Julia W from Bayside, NY Yes, Julia W recommends this product! This is a lovely well made item! The embellishments on this harness are extremely attractive and sturdy. My Multipoo looks adorable in this and has received many compliments.